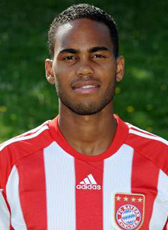 When his contract at Willem II expired in summer 2010, Boy Deul went on trial at Bayern München. Thanks to his successful trial he was offered a 1-year contract at the German club. Deul is playing for the Reserves of FCB playing at the Third Bundesliga. His contract was extended with another season, but he became severely injured in April 2011. He returned in training in January 2012. Deul was released on a free transfer at the end of the 2011-12 season. He returned home signing a one year contract at SC Veendam until 2013 with an option for another season. SC Veendam went bankrupt in April 2013 and Deul was released from his contract. In July 2013, Deul moved to Belgium to sign a 2-year contract until 2015 at FC Antwerp. The Belgian club is coached by Dutch coach Jerrel Hasselbaink. However after just a month in training, club and player decided to release the contract without more communication about reasons. In July 2014 he signed a 1-year contract at FC Emmen. During the 2014-15 season his contract was renewed with one more season. After two seasons at FC Emmen Boy Deul moved to Ukraine and signed a two-year contract at FC Stal Kamianske where he is reunited with his former manager Joop Gall. A month later his former teammate Erixon Danso also signed at FC Stal Kamianske. In July 2017 his adventure ended and he tried a new one in Cyprus at Paphos for the 2017-18 season. In summer 2018 Boy Deul returned home to play for FC Volendam.